Aims and Objectives: Biologic width (BW) as defined by Cohen is the part of the supracrestal gingival tissues that occupy the space between the base of the gingival crevice and the alveolar crest; it includes the junctional epithelium and the connective tissue element. Interactions between dental crowns and the marginal periodontal tissues analyzed in many review papers concluded that the recognition of the BW, in terms of crown margin placement, is beneficial for periodontal health. Therefore, knowledge of the dimensions of the sum of the junctional epithelium and connective tissue attachment as well as the sulcus depth (SD) is of clinical relevance. The aim of the study is to compare the average SD and BW clinically measured around teeth with the standard application of a mean value of 0.69 mm and 2.04 mm, respectively, found by Gargiulo et al.in a histological study on cadavers. Materials and Methods: Forty-two healthy patients with age ranging from 20 to 50 years presented to the Multidisciplinary Department at the Lebanese University. A total of 504 tooth sites of 126 teeth were selected and measured by two periodontists. All measurements were done on teeth requiring infiltration anesthesia for surgical, restorative, or endodontic procedures on neighboring tooth/teeth, which eliminate any ethical concerns. The SD and the distance from gingival margin to bone crest at four sites per tooth; mesial, midbuccal, distal, and midlingual/palatal were measured. Clinical, BW was calculated by subtracting SD from the distance between gingival margin to bone crest. Statistical Analysis: Friedman's ANOVA test, independent samples t-tests, and one-sample t-tests were applied. The IBM® SPSS® statistics 20.0 statistical package was used to carry out all statistical analyses. Results: The BW is statistically significantly lower than the value stated by Gargiulo et al. (2.04 mm) with a mean value of 1.13 mm, whereas the SD is statistically significantly greater than the value stated by Gargiulo et al. (0.69 mm) with a mean value of 1.96 mm. Conclusion: It can be concluded that there is a need to create a patient/site-specific distance from the proposed margin of the restoration to the bone crest when restoring subgingivally fractured or carious teeth. This leads to more stable and healthy tissues when performing crown lengthening procedures. Therefore, using the term clinical, BW is more reliable and it should be used to reestablish stability and integrity of periodontal tissues around restored teeth. The concept of the biologic width (BW) refers to the soft tissue that is attached to tooth structure coronal to the alveolar bone crest. This complex area has been advocated as the sole indicator of tissue damage and breakdown when it is violated. The mean BW value of 2.04 mm was based on a histologic description done by Gargiulo et al., who described the dimensions and relationship of the dentogingival junction in humans. Measurements were made on 30 autopsy specimens with 287 individual teeth reported the following mean dimensions: a 0.69 mm of sulcus depth (SD), a 0.97 mm of epithelial attachment, and a 1.07 mm of connective tissue attachment. Based on this work, the BW which represents the sum of the epithelial and connective tissue measurements is commonly stated to be 2.04 mm. Vacek et al., in contrast to the previous study, conducted a similar cadaver specimen using nondecalcified human block sections to minimize the modification of tissue dimensions inherent to decalcification and tissue preparation., Measurements were performed on 171 tooth surfaces; authors reported a mean of 1.91 mm of BW (1.34 mm for SD, 1.14 mm for epithelial attachment, and 0.77 mm for connective tissue attachment). When comparing the dentogingival tissue dimensions between surfaces (buccal, lingual, mesial, and distal), the authors found no significant differences for any of the tissue dimensions. Evidence from different types of histological and clinical studies suggests that a breach of the BW has an impact on periodontal tissue health represented clinically, by gingival recession or periodontal pockets. Based on histologic observations in dog and human autopsy material, Wearhaug  found that when the margin of the crown did not come closer than 0.4 mm to the bottom of the pocket, there is no pocket deepening and attached fibers were not severed. In a beagle dog study, Pama-Benfenati et al. compared osseous response in case when amalgam restorations in Class V cavities were located at the crestal level (experimental sites) to those placed at 4 mm supracrestally (control sites). Histological results demonstrated a greater inflammation-related bone loss in the experimental sites versus minimal resorption in control sites; authors concluded that when the restorative margin is placed too close to the bone crest, it impinges on the gingival attachment apparatus and violates the BW causing bone resorption, which becomes more severe in case of thin cortical bone. A similar study was performed by Tal et al. in a beagle dog model comparing periodontal tissue response in case of BW violation. Class V cavities with amalgam restorations were prepared at the osseous crest in canine teeth (experimental teeth) and compared to control sites with Class V notches placed at the cervicoenamel junction; after 1 year of follow-up, the reestablished BW at test sites was significantly narrower than the one reestablished at control teeth (0.9 vs. 4.47 mm) and gingival recession and bone loss were significantly more severe at test sites compared to control teeth (3.16 and 1.17 mm vs. 0.5 and 0.15 mm, respectively). A long-term success of a restored tooth is related to the preservation of a healthy periodontium through the respect of the relationship between the various periodontal complex components and the prosthetic/restorative margins. Newcomb  in a clinical observation compared 66 anterior crowns with subgingival margins of varying depths to uncrowned contralateral controls and mentioned the greatest degree of gingival inflammation when subgingival crown margins were placed near the base of the gingival crevice. Nevins and Skurow  recommended limiting subgingival margin extension from 0.5 to 1 mm to avoid the disruption of the junctional or connective tissue attachments during preparation and impressing taking. de Waal and Castellucci  described four types of pathologic alterations in response to violation of the BW: (a) localized infrabony pocket inferior to the encroaching margin, resulting in an iatrogenically induced periodontal breakdown; (b) localized bone loss followed by gingival recession in cases of thin cortical plates; (c) localized gingival hyperplasia with minimal bone loss, when the restorative margins are placed subgingivally in cases of altered passive eruption; and (d) combinations of the previously described alterations. Günay et al. compared 116 prepared teeth to 82 unrestored teeth in 41 patients for 2 years and found increased papillary bleeding score and probing depths at sites where the restorative margin was 1 mm from the bone crest; authors concluded that restorative margin placement within the BW is detrimental to periodontal health. Interactions between dental crowns and the marginal periodontal tissues were analyzed in the last decade by many authors namely Padbury et al. and Kinane et al. and recently in two systematic reviews done by Kosyfaki et al. and Schmidt et al. It was concluded that the recognition of the BW, in terms of crown margin placement, is beneficial for periodontal health. Therefore, knowledge of the dimensions of the junctional epithelium and connective tissue attachment is of clinical relevance. A “magic number” for the BW as a treatment objective cannot be recommended as the use of mean values could mask the actual clinical situation. The purpose of the present study is to find the average clinical, BW dimension around teeth of selected patients and to compare these dimensions with the histological finding done by Gargiulo et al. This is a pilot study for further research planned to be performed concerning BW dimensions in a Lebanese population. Forty-two systemically healthy adult patients (21 women and 21 men) ranging in age between 20 and 50 years with a mean of 27.26 years attending the Multidisciplinary Department at the Lebanese University, Faculty of Dental Medicine, Hadat, Lebanon, and a private clinical practice between September 2015 and December 2016 were recruited for the study. Data were gathered by two periodontists on teeth with the absence of signs of inflammation and adequate oral hygiene measures a evidenced by a full-mouth bleeding scores <20% and full-mouth plaque scores <20%. All measurements were done on teeth requiring anesthesia infiltrations for surgical, restorative, or endodontic procedures on neighboring tooth/teeth; hence, in all cases, infiltration anesthesia was already performed which eliminates any ethical concerns. Patients were informed about all measurements and the scientific goal of the study; only those who approved their participation were included in the study. Exclusion criteria included patients taking medications known to be associated with gingival overgrowth such as cyclosporin, calcium channel blockers, diphenylhydantoin, or others; patients with a history of orthodontic therapy; patients smoking more than 10 cigarettes per day; teeth with recession; malpositioned teeth; previous periodontic treatment; crowned teeth or teeth presenting with a cervical restoration; teeth with mobility; and furcation involved teeth. The study population consists of 42 patients (21 males, 21 females); a total of 504 tooth sites of 126 teeth (58 anterior included upper and lower canines and incisors, and 68 posteriors included upper and lower premolars and molars, except wisdom teeth) were measured. The SD and the distance from gingival margin to bone crest at four sites per tooth, mesial, midbuccal, distal, and midlingual/palatal (M, MB, D, ML/P), were measured using a periodontal probe, 15 UNC color-coded probe ,,,,,,, [Table 1]. Clinical, BW was calculated by subtracting SD from the distance between gingival margins to bone crest. All measurements were conducted by two expert periodontists from the Department of Periodontology at the Faculty of Dental Medicine at the Lebanese University. Descriptive statistics were generated to detail the distribution of measurements SD and BW. Data for overall BW and SD measurements were normally distributed, but data categorized according to site (mesial, distal, lingual, and buccal) were not normally distributed. The effects of gender, tooth location (anterior vs. posterior), and measurement site (mesial, buccal, distal, and lingual) on SD and BW were assessed separately because of violations of the assumptions of independence of observations, homogeneity of variances and covariances, and multivariate normality which precluded the use of two- and three-way ANOVA and MANOVA tests. Median levels of SD and BW were each compared between the four measurement sites among anterior teeth and posterior teeth and in the overall sample using Friedman's ANOVA test for dependent samples. Mean BW measurements in the male, female, and overall sample were compared to the established norm (2.04 mm ) using the one-sample t-test. The same test was used to compare the SD measurements in males and females and in the overall sample to the established norm by Gargiulo et al. (0.69 mm). Independent samples t-tests were used to compare BW and SD between males and females in anterior teeth and posterior teeth and in the overall sample and between anterior and posterior teeth in males and females and in the overall sample. Means, medians, standard deviations, and minimum and maximum values were reported in addition to test statistics and P values. The Bonferroni correction was applied to account for repeated comparisons, and statistical significance was set at 0.008 for Friedman tests (9 comparisons), 0.006 for independent samples t-tests (6 comparisons), and 0.0167 for one-sample t-tests (3 comparisons). The Statistical Package for Social Sciences (IBM SPSS®, version 20.0, Armonk, NY) was used to carry out all statistical analyses. 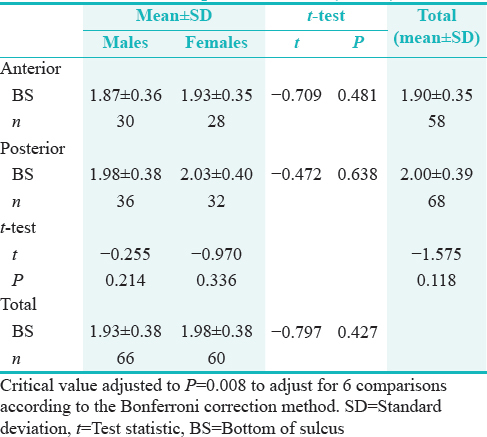 Median measurements of SD differed significantly between the different measurement sites in males and females and in both anterior and posterior teeth [Table 2]. Similar results were observed in males and females and in anterior and posterior teeth. median SD was similar on the mesial and distal sites (median values ranging between 2 and 2.5), and these values were significantly larger than median SD on the buccal and lingual sites (median values ranging between 1.5 and 2.0; P < 0.006). Median measurements of BW, on the other hand, were similar between all measurement sites in anterior and posterior teeth and in males and females [median values of 1.0 for all measurements; [Table 3]. Although the general comparison was statistically significant (borderline) in the overall sample of posterior teeth (P = 0.006), significance was lost in post hoc testing. Mean values of BW were 1.14 ± 0.31 mm and 1.11 ± 0.26 mm in males and females, respectively, and 1.12 ± 0.26 and 1.13 ± 0.30 in the anterior and posterior teeth, respectively [Table 4]. 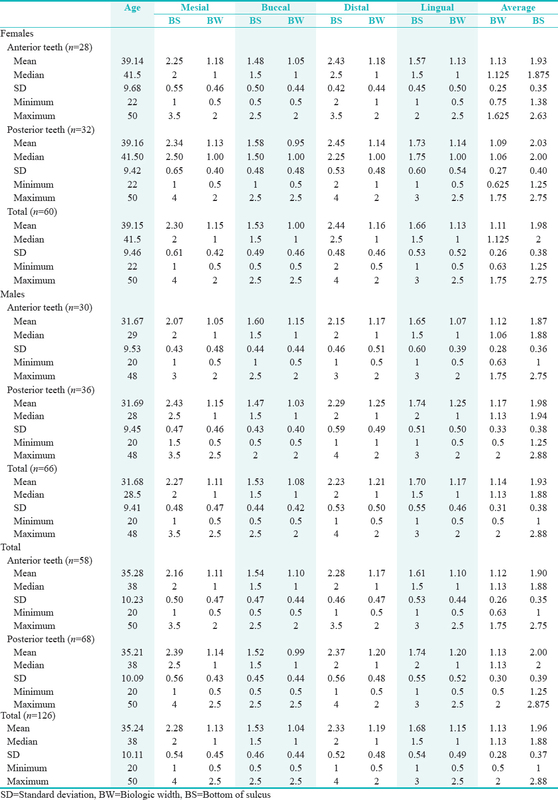 Mean values of SD were 1.93 ± 0.38 mm in males and 1.98 ± 0.38 mm in females, and it was 1.90 ± 0.35 mm in the anterior teeth and 2.00 ± 0.39 in the posterior teeth [Table 5]. 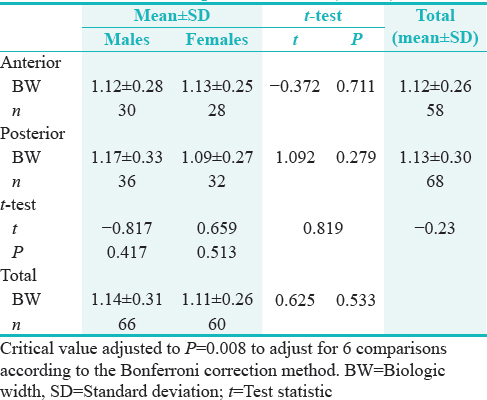 BW and SD were similar across genders in both anterior and posterior teeth and in the overall sample [P > 0.008; [Table 4] and [Table 5]. Similarly, there were no differences between anterior and posterior teeth in males or females or in the total sample. Mean values of BW obtained in this study were statistically significantly smaller than that published by Gargiulo et al. (2.04 mm) in females (1.11 ± 0.26 mm) and males (1.14 ± 0.31 mm) and in the overall sample [1.13 ± 0.28 mm; [Table 6]. The measurements of SD, on the other hand, was statistically significantly larger than that published by Garguilo et al. (0.69) in females (1.98 ± 0.38) and males (1.93 ± 0.38) and in the overall sample [1.96 ± 0.37; [Table 7]. Based on multiple studies,, measurement of the supracrestal gingival tissue (SGT) using sounding is considered as a predictable technique for clinical measurement as well as periodontal research without harmful effect for soft tissues. Isidor  in a clinical study mentioned that in 90% of the time, probing was identical to surgical measurements within 1 mm of difference; Ursell  noticed a 0.12 mm of mean difference between surgical and transgingival measurements. This clinical study performed on 42 patients (21 males, 21 females) on 126 teeth measured at the M, MB, D, ML/P sites with 504 sites revealed mean values of BW (1.13 ± 0.28 mm) statistically significantly smaller than that published by Gargiulo et al. (2.04 mm) and less than the radiographic measurements reported by Alpiste-Illueca  which was 1.91 mm. These results are similar to clinical measurements mentioned by Al-Rasheed et al. Authors reported that the average clinical, BW dimension obtained from measuring 900 sites on 300 teeth in a selected sample of Saudi patients was 1.24 mm. On the other hand, the measurements of SD in the overall sample of this study were 1.96 ± 0.37 mm, which is statistically significantly larger than that published by Garguilo et al. with 0.69 mm as mean value. This difference may be explained by soft tissue penetration of the probe tip during probing depth measurements without clinical signs such as pain or bleeding; such an explanation was confirmed by Armitage et al. on a study done on beagle dogs to evaluate the penetration of a probe with a standardized force of 25 g. They reported that in gingivitis specimens, it stopped 0.1 mm short to its apical end, whereas, in healthy specimens, the probe penetrated the epithelium to about two-thirds of its length. In humans, the probe tip penetrates to the most coronal intact fibers of the connective tissue attachment apical to the junctional epithelium. The present study questioned the recommended 3 mm of a gold supraosseous distance after crown lengthening procedure which has been generally performed using a mean value of 2.04 mm as the sole indicator for the amount of bone resection needed during surgery. On the other hand, prosthodontists usually place the limit of their restoration according to two methods., The first method is by measuring the sulcus and then extending the limit of the restoration midway through the sulcus, whereas the other method is to extend the margin of the restoration 0.5 mm into the sulcus regardless of its depth. The difficulty in evaluating SD in terms of margin placement is the penetration of the periodontal probe into epithelial attachment during probing. Our measurements showed that there always is an overestimation of the SD (1.5–2 mm); this overestimation will trick the clinician to place the margin deeper into the sulcus thereby violating the BW. Previous studies done by Lanning et al. and Perez et al. focused on the evaluation of the SGTs (sulcus width and BW), claiming that this SGT will reestablish itself after crown lengthening procedures. Knowing that the SD can be overestimated, we need to start focusing on a clinical, biologic depth and not an SD so that we can provide the prosthodontist with a more reliable and reproducible measurement of the sulcus to help with subgingival margin placement when needed. With the limitation of this study and the previous literature review focusing on the variability of the BW, a patient-customized surgical crown extension and marginal prosthetic limits based on individual soft and hard tissue parameters should be performed; a large population and further researches are necessary to obtain more powerful guidelines for both surgeons and prosthodontics. It can be concluded that there is a need to create a patient/site-specific distance from the proposed margin of the restoration to the bone crest when restoring subgingival fractured or carious teeth. This leads to more stable and healthy tissues when performing crown lengthening procedures. Therefore, using the term clinical, BW is more reliable and it should be used to reestablish stability and integrity of periodontal tissues around restored teeth. Further research on a wider sample size is needed to compare in details the tooth location and gender effect on the clinical, BW specifically in a Lebanese population. Cohen DW. Periodontal Preparation of the Mouth for Restorative Dentistry. Presented at the Walter Reed Army Medical Center, Washington; 3 June, 1962. Vacek JS, Gher ME, Assad DA, Richardson AC, Giambarresi LI. The dimensions of the human dentogingival junction. Int J Periodontics Restorative Dent 1994;14:154-65. Boonstra H, Oosterhuis JW, Oosterhuis AM, Fleuren GJ. Cervical tissue shrinkage by formaldehyde fixation, paraffin wax embedding, section cutting and mounting. Virchows Arch A Pathol Anat Histopathol 1983;402:195-201. Dragoo MR, Sullivan HC. A clinical and histological evaluation of autogenous iliac bone grafts in humans. I. Wound healing 2 to 8 months. J Periodontol 1973;44:599-613. Wearhaug J. Tissue reactions around artificial crowns. J Periodontol 1953;24:172-85. Pama-Benfenati S, Fugazzotto PA, Ferreira PM, Ruben MP, Kramer GM. The effect of restorative margins on the postsurgical development and nature of the periodontium. Part II. Anatomical considerations. Int J Periodontics Restorative Dent 1986;6:64-75. Tal H, Soldinger M, Dreiangel A, Pitaru S. Periodontal response to long-term abuse of the gingival attachment by supracrestal amalgam restorations. J Clin Periodontol 1989;16:654-9. Newcomb GM. The relationship between the location of subgingival crown margins and gingival inflammation. J Periodontol 1974;45:151-4.
de Waal H, Castellucci G. The importance of restorative margin placement to the biologic width and periodontal health. Part II. Int J Periodontics Restorative Dent 1994;14:70-83. Günay H, Seeger A, Tschernitschek H, Geurtsen W. Placement of the preparation line and periodontal health – A prospective 2-year clinical study. Int J Periodontics Restorative Dent 2000;20:171-81. Padbury A Jr., Eber R, Wang HL. Interactions between the gingiva and the margin of restorations. J Clin Periodontol 2003;30:379-85. Kinane DF, Peterson M, Stathopoulou PG. Environmental and other modifying factors of the periodontal diseases. Periodontol 2000 2006;40:107-19. Kosyfaki P, del Pilar Pinilla Martín M, Strub JR. Relationship between crowns and the periodontium: A literature update. Quintessence Int 2010;41:109-26. Schmidt JC, Sahrmann P, Weiger R, Schmidlin PR, Walter C. Biologic width dimensions – A systematic review. J Clin Periodontol 2013;40:493-504. Cortellini P, Pini Prato G, Tonetti MS. Periodontal regeneration of human infrabony defects. I. Clinical measures. J Periodontol 1993;64:254-60. O'Leary TJ, Drake RB, Naylor JE. The plaque control record. J Periodontol 1972;43:38. Greenberg J, Laster L, Listgarten MA. Transgingival probing as a potential estimator of alveolar bone level. J Periodontol 1976;47:514-7. Ursell MJ. Relationships between alveolar bone levels measured at surgery, estimated by transgingival probing and clinical attachment level measurements. J Clin Periodontol 1989;16:81-6. Lanning SK, Waldrop TC, Gunsolley JC, Maynard JG. Surgical crown lengthening: Evaluation of the biological width. J Periodontol 2003;74:468-74. Al-Rasheed A, Ghabban W, Zakour A. Clinical biological width dimention around dentition of a selected Saudi population. Pak Oral Dent J 2005;25:81-86. Perez Jr., Smukler H, Nunn ME. Clinical evaluation of the supraosseous gingivae before and after crown lengthening. J Periodontol 2007;78:1023-30. Shobha KS, Mahantesha, Seshan H, Mani R, Kranti K. Clinical evaluation of the biological width following surgical crown-lengthening procedure: A prospective study. J Indian Soc Periodontol 2010;14:160-7. Listgarten MA, Mao R, Robinson PJ. Periodontal probing and the relationship of the probe tip to periodontal tissues. J Periodontol 1976;47:511-3. Ganji KK, Patil VA, John J. A comparative evaluation for biologic width following surgical crown lengthening using gingivectomy and ostectomy procedure. Int J Dent 2012;2012:479241. Deas DE, Moritz AJ, McDonnell HT, Powell CA, Mealey BL. Osseous surgery for crown lengthening: A 6-month clinical study. J Periodontol 2004;75:1288-94. Isidor F, Karring T, Attström R. Reproducibility of pocket depth and attachment level measurements when using a flexible splint. J Clin Periodontol 1984;11:662-8. Alpiste-Illueca F. Dimensions of the dentogingival unit in maxillary anterior teeth: A new exploration technique (Parallel profile radiograph). Int J Periodontics Restorative Dent 2004;24:386-96. Armitage GC, Svanberg GK, Löe H. Microscopic evaluation of clinical measurements of connective tissue attachment levels. J Clin Periodontol 1977;4:173-90. Parashar A, Zingade A, Sanikop S, Gupta S, Parasher S. Biological width: The silent zone. Int Dent J Stud Res 2015;2:11-15. Mittal P, Manjunath RG, Garg J, Agarwal A, Agarwal H, Khan S. Biological width: An important link between periodontics and restorative dentistry. J Dent Sci Oral Rehabil 2016;7:125-30.